This is an extended version of a recipe that I found in the NY Times a while back. The basic recipe was just the cauliflower with raisins, capers and almonds. I made it a couple of times and really enjoyed it all by itself. But to make a whole meal out if it it needed some extensions. The main ingredients in this dish are really the raisins and the capers as they have the strongest flavor. I thought that kale would be going well with either or both of them too. Then added some cooked bulgur (which can easily be replaced by other grains: I can imagine quinoa or brown rice here very well). And instead of oven roasting the vegetables I made a stir-fried wok dish out of it. There you go. A good and filling healthy vegetarian meal. PS: Not everyone likes raisins in savory dishes or capers in general. The amounts of these two ingredients can changed according to taste or. You might even serve them on the side or just sprinkle on top of each plate to everyone's taste. 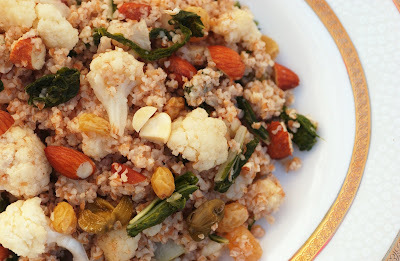 Put bulgur in a bowl. Pour 3 cups of boiling water over it and let stand for 15 minutes. Drain and press out the remaining water. Roughly chop the almonds and toast them in a pan over medium heat for 5-10 minutes. Set aside. heat 1 tablespoon of butter in the same pan. Once it's melted stir in the breadcrumbs and cook until golden brown, ca. 2-3 minutes. Set aside. Wipe out the pan and melt another half tablespoon of butter. Add raisins, vinegar and 1 tablespoon of water. Simmer until raisins are plump, about 5 minutes. In a wok pan, heat one teaspoon of olive oil. Add the cauliflower florets and cook for about 5-7 minutes. They should be cooked but still crunchy. Add the chopped kale and cook until wilted. Now stir in the drained bulgur. Add the raisins, almonds, capers, and breadcrumbs. Season with salt and pepper to taste. Cook for another 2-3 minutes. Ready to serve.